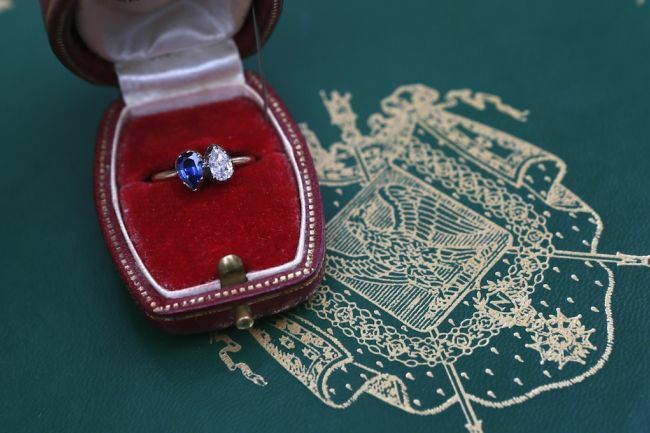 An anonymous bidder now owns a sparkling piece of history: an 18th century blue sapphire and diamond engagement ring previously owned by Josephine, the fiancee of Napoleon. While it didn’t fetch as much as contemporary celebrity jewelry pieces (such as those of Elizabeth Taylor’s) in auctions, the teardrop-shaped toi et moi ring nevertheless cost the winning bidder a pretty penny: $949,000 to be exact. French auction house Osenat revealed that they opened the bidding at 10,000 euros, and in just fifteen minutes, it went under the hammer to the tune of 730,000 euros and to tremendous applause. Days before the auction took place, the double-gem engagement ring set in gold (each stone weighed a little under a carat) was already creating a buzz among bidders and jewelry fanatics. Interest in the ring kept the auction house’s phone ringing off the hook by international bidders, adding to the estimated 300 people who attended the actual bidding in Osenat. The Fontainebleau-based auctioned house gave a market value estimate of the ring in their catalog, but did not include the historical premium brought on by the fact that the ring was, in fact, given to Josephine by Napoleon when he asked for her hand in marriage. However, the day of the auction was nothing short of historically significant: the sale happened on what should have been Josephine’s 250th birthday. Jean-Christophe Chataignier of Osenat reports that while the ring does not look as impressive as many other historical pieces of jewelry, the story behind it gives it a precious patina. “At the time Napoleon was a young and promising officer, but he was not rich. He must have broken his wallet to buy this quality ring,” he said in an interview with ABC News.